SO Fine Art Editions is pleased to present an exclusive lithograph print by artist Colin Davidson. 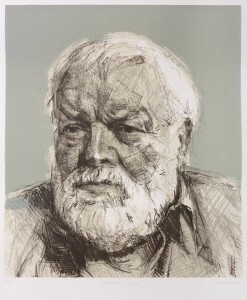 The print depicts one of Northern Ireland’s foremost poets, Michael Longley, CBE. Michael Longley was born in Belfast, educated at the Royal Belfast Academical Institution, and subsequently read Classics at Trinity College, Dublin, where he edited Icarus. His much lauded works have been awarded multiple prizes including the T. S. Eliot prize, the Whitbread Poetry Prize, the Hawthornden Prize, and a London Awards for Art and Performance prize. Longley was Professor of Poetry for Ireland from 2007 to 2010, a cross-border academic post set up in 1998, previously held by John Montague, Nuala Ní Dhomhnaill and Paul Durcan. He holds honorary doctorates from Queen’s University Belfast and Trinity College, Dublin and was the 2001 recipient of the Queen’s Gold Medal for Poetry. Longley was appointed Commander of the Order of the British Empire (CBE) in the 2010 Birthday Honours. Colin Davidson is a contemporary artist, living and working near Belfast, Northern Ireland. Davidson is best known for his series of large-scale portrait heads. The painting Just Sharp Reminding (Portrait of Duke Special) was awarded the Ireland – US Council and Irish Arts Review Award at the Royal Hibernian Academy, Dublin in June 2010, and the painting Thread the Light (Portrait of Glen Hansard) was awarded the Perpetual Gold Medal at the Royal Ulster Academy, Belfast in October 2010. 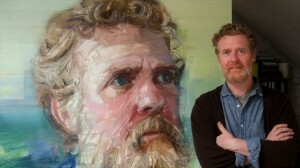 The painting Pure To Another (Portrait of Brian Kennedy) was awarded the Perpetual Gold Medal at the Royal Ulster Academy, Belfast in October 2011. Davidson’s work is held is several private and public collections, among them the British Broadcasting Corporation, The National Gallery of Ireland, and the Arts Council of Northern Ireland. The lithograph Michael Longley is in an edition of 40, and available exclusively at SO Fine Art Editions, Dublin. See work by Colin Davidson from SO Fine Art Editions.